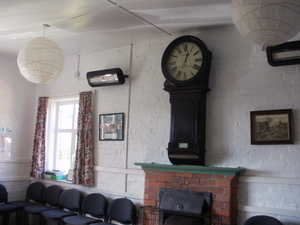 The original school clock in Abdon Village Hall was built by Thomas Glase who was born in Cleobury North. He was a gunsmith, jeweller and clock maker who died in 1851. In January/February 2012 the clock was restored in memory of Tom Howells. Tom was a much loved and respected member of the community, neighbour, friend and family member. Tom used to attend the school and had fond memories of the large clock. Following the initial suggestion to restore the clock, the Abdon Village Hall Management Committee took this forward as a fitting tribute to Tom. The money for the restoration was raised by donations from the community. In addition Don and Jo held a 'Supper Evening' at Cobbler's Dingle and Guy Rowland held an 'Evening with Guy' of song, music and anecdotes at the Village Hall.